I love pumpkin pie. It is my favorite dessert of all time. We invited friends over for dinner, they just recently moved to MD from NYC (where we met) and Suzie arrived with a homemade pumpkin pie in her hands. I don't think I've ever actually tasted a pumpkin pie made from a roasted pumpkin and not out of a can. And I am here to tell you that doing the work and roasting the pumpkin is worth every second it takes. This pie is fantastic! I've never tasted anything like it. I don't think I'll be able to enjoy canned pumpkin ever again...Okay that's a total lie!! Boy does that look good. You topping looks like it is getting ready to jump at you. You know, I'm not even sure where you get the type of pumpkin that you use to make a pie-- can you get it at a regular old grocery store? I've read, but not tried, that you can also use any old squash. 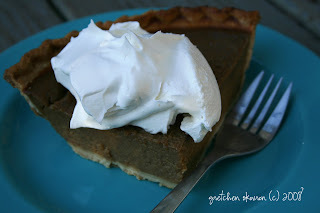 I should add, though, that I have yet to actually eat a pumpkin pie made from scratch. I'm w/ you, G, it's my fave. Got a friend who is looking for a gluten-free stuffing recipe--got anything on tap? I'll never forget the time that Gretchen and I were in Butler and she order two pieces of pumpkin pie because she was so excited to be eating pumpkin pie out of season. On another note, my mom and I tried to make a "real" pumpkin pie once it tasted great but was kinda green.